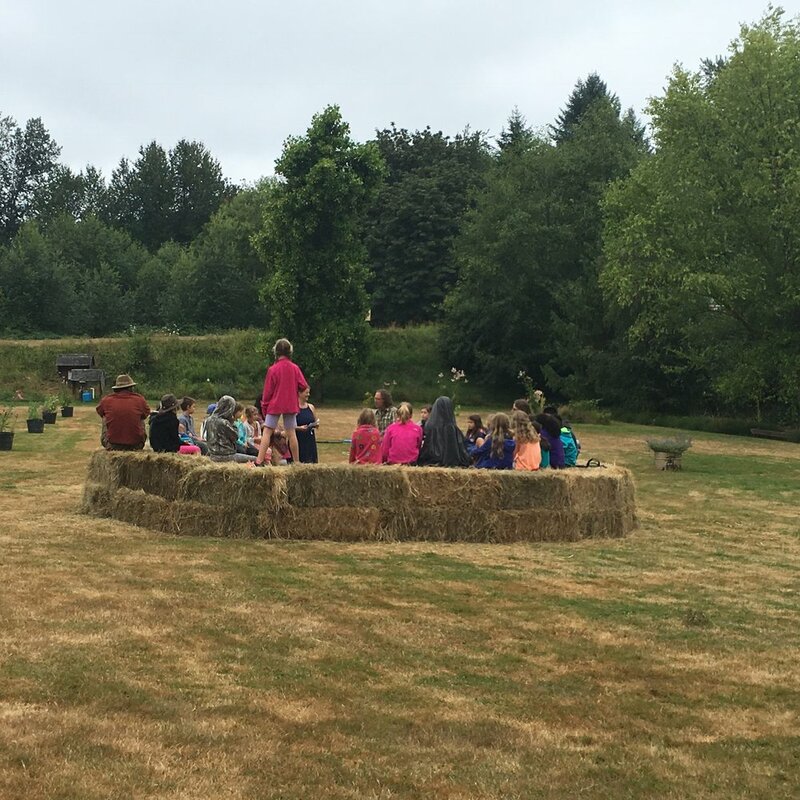 Following two successful runs of our Sandy Herb Camp, a nature-based summer camp for kids, we are now gearing up for round 3! This annual 5-day camp is organized and run by Eclectic’s owner, Chris Alstat, and her long-time friend Heather Sullivan. Both were inspired by making herbal crafts and remedies with their own children, and noticing the sense of wonder and joy it brings them to make magic out of plants. They share a goal of instilling interest in the world of healing plants in children, so that they may grow up with a heightened sense of respect and love for nature, as well as the confidence to take health and well-being into their own hands. The camp is held on Eclectic Institute’s beautiful 75-acre property in Sandy, Oregon, at the base of Mount Hood. There are sprawling fields, a small fruit orchard, a pond with its fair share of geese and frogs, and an organic garden teeming with veggies and healing herbs. This gives kids plenty of opportunity to experience a wide variety of herbs through sight, smell, touch, and taste. They can pick their own fragrant flowers and leaves and rush them to our remedy-making station to learn how to process them into healing teas, tinctures, salves, syrups, and other crafts. As herbalists with backgrounds in naturopathy and nursing, Chris and Heather have plenty of knowledge and experience harnessing the healing power of plants. As mothers, they’ve both been able to observe what kids find interesting, and what actually works. Some of their past projects have included herbal soap and shampoo, natural sunscreen, an herbal first aid kit, elderberry syrup, and so much more! The kids also glean valuable culinary skills, making things like herb crackers, salad dressings, and herbed butter. While there are a few hold-overs each year, the menu of crafts and treats is mostly refreshed each time around. This year, kids will be learning to make fresh herb skillet bread, parsley and cilantro pesto, energy bars, herbal remedies, lotion bars, tooth powder, lip balm, and a tasty cough syrup, to name just a few! Between all this herb crafting, kids also have plenty of time to run around the fields in a mix of organized games and imaginative free time. They’ll also learn skills to identify garden plants and trees. Finally, the camp winds down with gathering herbs for relaxing herbal foot baths. Something that will set this year’s herb camp apart from the rest is that we will be integrating it with our Budding Herbalist Internship Program (see previous blog, “Eclectic’s New Internship Program: What It Is and Why It Matters”). For six weeks this summer, there will be six interns living on our property, working on the herb farm, and taking evening and weekend classes on an array of topics related to herbalism. Their final week will coincide with the kids herb camp, which will give the interns an opportunity to put to use some of the knowledge and skills they picked up by teaching them to kids! Passing down knowledge directly is paramount to the world of herbalism, so we think this is a perfect way to wrap up our internship. This year’s Sandy Herb Camp will run from August 13-17, 9 am - 2 pm. We welcome kids ages 8-12. It’s a perfect opportunity for kids to ditch the iPads and get their hands dirty in nature. They’ll be so immersed in new experiences, they won’t even miss screen time! If you’re interested in having your child participate, you can visit https://www.eclecticherb.com/herbcamp for more information and a link to register. We hope to see you here!